Yes, John Fetterman is one hell of a big guy. And no, he doesn't look anything like a typical politician. It's always been easy — an imperative, even — for the press to home in on those points, and that's certainly been the case since Fetterman announced on Sept. 14 that he's jumping into Pennsylvania's not-easy (and not-cheap) primary race for the U.S. Senate. But the first time I spoke on the phone with the mayor of Braddock — a now-tiny ghost of a steel town that's top among the Pittsburgh region's poorest (and, in recent years, most innovative) communities — what struck me as most unusual wasn't the look of the guy at all, but the sound of him. He doesn't really sound like a politician at all, I thought then. Unpolished. That's good. In that brief conversation a couple of years back, and later that night during his talk at the Jefferson Educational Society, Fetterman discussed what was finally, actually happening for the better in Braddock after decades of continuous, mass-scale structural and social implosion and decay. Here's Braddock's backstory in (very) brief: The site of Pittsburgh steel baron Andrew Carnegie's first mill — along with Carnegie's first library — the 20,000-plus-population borough was once a bustling, brimming-with-business, 20th century model of industry-born affluence. But between the middle and end of the last century, it became a modern model of the effects of industrial abandonment, losing 90 percent of its businesses – and 90 percent of its population. In Braddock — and to different extents across other Rust Belt cities — what's been left in that implosion's wake is inequality, Fetterman said during a talk with the Reader last week: "Inequality in income, inequality in public safety, inequality in healthcare … even inequality in the quality of the air we all breathe." Fetterman has laid a groundwork of change for those kinds of issues in Braddock, and, he said, they're the kinds of issues that need be represented on Pennsylvania's behalf at the tables of national politics. "I just really want a bigger platform," he said, and, when it comes down to it, running for the Democratic nomination for Senate "is pretty much a vehicle" to carry that cause. "It's the same campaign" it's always been — "just in a different stadium." Fetterman made it clear during his 2013 appearance in Erie that he doesn't have all the answers for solving the issues of poverty, crime, and other problems that come with industrial collapse and subsequent decay — not for Braddock, not for Erie, not for any Rust Belt city, or anywhere else. What he has brought to Braddock, though, are actions that have led to some real, demonstrable results. Since first winning office there in 2005, Fetterman, as I pointed out in a 2013 Reader article, has devoted his work as mayor (a technically part-time position that pays about $150 a month) to practical, hands-on actions to make the town's streets safer; establish youth employment programs; attract artists to its cheap and available working and living spaces; and pursue urban renewal and redevelopment projects. He's been dubbed by The Guardian as "America's coolest mayor," by the New York Times as "The Mayor of Rust," and featured in Rolling Stone as "The Mayor of Hell." He's done numerous TEDx talks, appeared on The Colbert Report, and brought Braddock's evolving story into the headlines of major news publications and programs across the country. "The thing I care about most," he said in 2013, is that "things continue getting better. The direction is more important than the plan." That's good, I thought then (and think now). But, like I've said before, there's little room in that kind of headspace for old ways of thinking, for the business-as-usual model of municipal leadership. And, for more process-oriented, politics- prone leaders and planners, that seems to be what's still sort of scary about Fetterman: It's that — far more than his size or tattoos or anything else — that keeps him on their fringe. 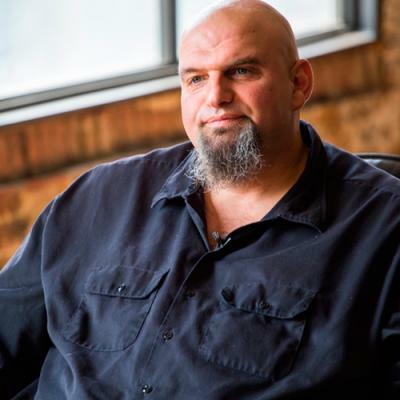 Now, when I spoke with Fetterman again recently, he was, as far as I could tell, in full-on campaign mode: Eager to talk shop, to outline the issues in general, to state the ways that he's a good pick for the job. And all of that's important if he's to have any chance of gathering the kind of major support (and major funding) that will be needed to make a legitimate run against the other well-seasoned candidates vying for the Democratic nomination (retired Navy admiral and former congressman Joe Sestak, and Katie McGinty, former chief of staff for Gov. Tom Wolf), let alone to challenge the powerful incumbent, Republican U.S. Sen. Pat Toomey. But for Fetterman's sake (and more, for the sake of what he's standing for) I'm hoping, way down deep in my heart of hearts, that playing through the political routine doesn't mean becoming a routine politician. Because win or lose, and as in Braddock itself, it's what's still left unpolished that truly deserves our attention.